My parents noted some problems with Firefox bookmarks; crashes when attempting to organize bookmarks and so on. I experienced some weird effects from a large bookmark file on my system as well. I looked into how the bookmarks are stored. (Of course, "foo" is a stand-in for whatever one has actually named their user directory.) Although the data is in SQLite format, the bookmarks remain portable; Firefox allows users to export and import bookmarks as html files, instead of the less familiar SQLite database file format. If there are problems with bookmarks, it's not always clear whether the problem is in a single bookmark entry from a selected website, or whether the SQLite index which manages all the bookmarks has become corrupted. It's much easier to restore the database, so this is probably the best starting solution attempt. As a first solution, it's easier to restore the database, which can be done in about 3 minutes. The steps, as I do them, are to, 1) export the bookmarks file, 2) delete the old bookmarks file (and related backups) in the mozilla folder, and then, 3) re-open Firefox and import the exported bookmarks. This will reestablish and repopulate the database, which should then be stable. 1) Open Firefox, go into Bookmarks -> Organize Bookmarks -> Import and Backup -> Export HTML . 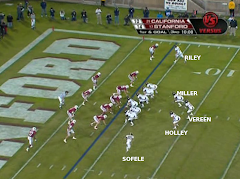 This exports the bookmarks in html format. I gave my exported file the name bookmark.html, but any name is fine. 3) Re-open Firefox and import the previously exported bookmark.html file (or whatever you named it when exporting). First, it's worthwhile to make a copy of places.sqlite, and then examine the copy instead of the original. If one is able to locate the problem in the copy, one can repair it there without damaging the original. Copy it back when complete and tested. Secondly, going into the places.sqlite file to examine it, bookmark by bookmark, can be done by Command Line commands or via a GUI. We're talking about masochism either way -- the ultimate masochism would be using the command line. Using command line sqlite commands is beyond the scope here, but there are many tutorials out there, such as this one at the SQLite site. Thirdly, because command line appears less efficient in this case, I'd suggest using a GUI SQLite manager of some sort. This should make an inspection of the places.sqlite file easier than with the command line, at least for most people. The free, open-source SQLite Browser may be a good option. 2) it doesn't install, just compiles a binary. But we can copy the binary into any directory we wish and start if from there. 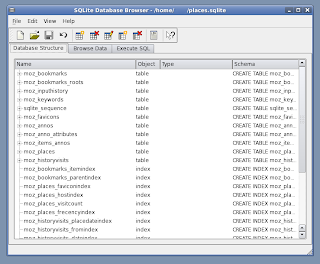 With the program running, open the copy of the bookmarks file places.sqlite (Figure 1). The bookmarks file/database appears to have a fairly elaborate structure. Looking for corrupted characters would take too much time for my taste in this structure; it's easier for me to wipe-out my bookmarks and start over again. That said, SQLite Browser is a helpful application and would be very useful in a situation where one had a simple SQLite database, say, a personal database for birthdays or anniversaries. Much more can obviously be said about these bookmark problems and about SQLite. It's good to understand that there is an additional layer beyond Firefox, under the hood. A couple of options were provided above and it's my hope we can all hang on to our bookmarks.